"Guide the people by law, subdue them by punishment; they may shun crime, but will be void of shame. Guide them by example, subdue them by courtesy; they will learn shame and come to be good." 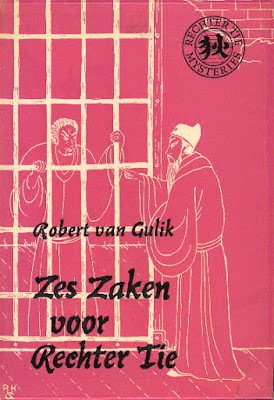 Robert H. van Gulik was a diplomat, sinologist and a writer whose career highlights included being the Dutch ambassador to Japan and authoring a series of novels, short stories and a couple of novellas about Judge Dee – which popularized historical mysteries and established them as a proper sub-genre in the 1950-and 60s. The series is set in 7th century China, during the Tang dynasty (AD 600-700), when a lauded magistrate and statesman, by the name of Di Renjie, presided over the courts of the Imperial Governments of the time. Celebrated Cases of Judge Dee (c. 1949) is a translation of an 18th century novel, Dee Goong An, which was loosely based on some of the cases handled by Di Renjie and formed an unofficial starting point of the series. And Di Renjie was, of course, the model for Judge Dee. The plots were constructed along the lines of the classical, Chinese detective stories, in which several, seemingly unrelated, cases are braided together, but Van Gulik threw out the supernatural agencies and replaced them with 20th century plot devices – such as a stronger emphasis on whodunit and the occasional locked room mystery. Judge Dee at Work: Eight Chinese Detective Stories (1967) is a collection of short stories and I have read them before, but they were spread out over two different volumes. 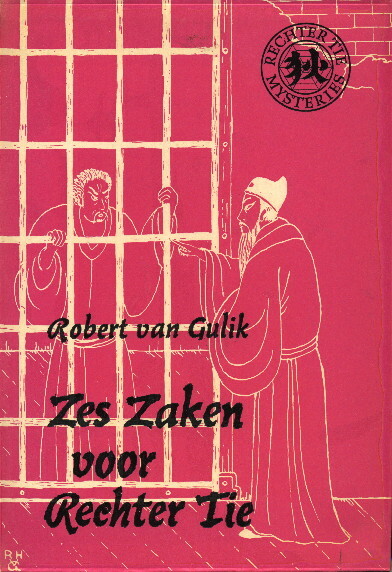 The title of the Dutch edition of Judge Dee at Work is Zes zaken voor Rechter Tie (Six Cases for Judge Dee, 1961), which didn't include "Five Auspicious Clouds" and "He Came With the Rain." They were published separately as Vijf gelukbrengende wolken (Five Auspicious Clouds, 1969) and included the novella Vier vingers (Four Fingers, 1964), which was published in The Monkey and the Tiger (1965) as The Morning of the Monkey. This was also the first time I read a Rechter Tie book in English. So it was somewhat like rediscovering this wonderful series. "Five Auspicious Clouds" is the first story from this collection and occurred when Judge Dee served for only a week as magistrate of Peng-lai, which is where my favorite entry in this series took place – namely the fabulous Fantoom in Foe-lai (The Chinese Gold Murders, c. 1959). Judge Dee is confronted with the apparent suicide of the wife of a notable legal-mind, but there are enough signs pointing towards murder and the extinguished, pentagon-shaped incense-clock seemed to have fixed the time of death. A good, somewhat clever story of domestic murder and notable for having found a way to use the smashed-watch-trick... in the year 633! "The Red Tape Murder" takes place in the same coastal district as the previous story, Peng-lai, in which Van Gulik allowed Judge Dee to be drawn into a military affair and exonerate Colonel Meng of a murder-charge and solve a pesky, bureaucratic problem of a missing document – a document interestingly titled P-404. They were unable to find that page! Anyhow, the murder of Colonel Soo turns out to be an impossible crime, because the innocent Meng appears to have been the only one who could've loosened the deadly arrow, but Judge Dee finds an alternative explanation and one that's reasonable clued. I've grown quite fond of this story, but not everyone is going to like it. 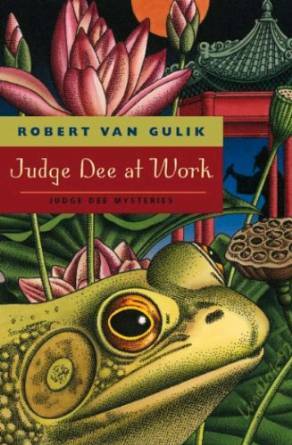 Judge Dee still presided over Peng-lai as magistrate in "He Came With the Rain" and takes place on one of the hottest, wettest days of the dog-days. A pawn-broker is found stabbed and hacked to pieces at an old, abandoned watchtower in the marches and the only witness is a deaf-mute girl – who lived in the crumbling tower. A couple of soldiers apprehended a blood-covered suspect, but, of course, Judge Dee comes to a different conclusion. This is one of those stories that should be read as a historical story and it’s character development instead of as a detective story. "The Murder on the Lotus Pond" has a change of scenery, the district of Han-yuan, which was the backdrop for The Chinese Lake Murders (1960) and The Haunted Monastery (1961), but in this minor case an elderly poet is killed in his garden pavilion. The setting and characters are very well drawn, but it's a minor, rather forgettable case and the murderer only got caught because he/she jabbered too much. "The Two Beggars" takes the reader to yet another district, Poo-yang, where The Chinese Bell Murders (1958) and The Emperor's Pearl (1963) took place, but Judge Dee's time as magistrate of this district also coincided with his visit to Paradise Island – recorded in The Red Pavilion (1964) and features several impossible murders. However, this short story seems to have been missed by everyone as just such a story, which begins when Judge Dee witnesses a ghostly apparition during the Feast of Lanterns. The escape of the apparition from a watched, moonlit garden, in which the "garden gate to the park outside was securely locked and barred," coincides with the discovery of a dead beggar at the bottom of a drain. The encounter in the garden is explained by itself towards the end of the story, but initial sighting gives Judge Dee a good reason to take a closer look as the supposed accidental death of the beggar and eventually discovers a murderer. A well-told and constructed story. The following story, "The Wrong Sword," remains in the district of Poo-Yang, but Judge Dee is absent for a large portion of the investigation and leaves two of his lieutenants, Ma Joong and Chiao Tai, in charge of tribunal. A case and an opportunity to prove themselves presents itself during a street performance: someone swapped a "trick sword" for a real one and that came at the expensive of a young boy's life. It’s an interesting approach to allow a troupe of Watson's investigate a flurry of potential murderers, before Judge Dee correctly arranges the gather information and evidence upon his return. "The Coffins of the Emperor" takes place in the isolated district of Lan-fang, the location of The Chinese Maze Murders (1952) and The Phantom of the Temple (1966), which is situated on the Western border of the empire – which has become a dark and desolate place during a warring conflict with the Tartar's. Judge Dee offers his assistance to the local military leader in solving a potential case of treason and clearing yet another military officer from a murder charge, before his head rolls off his shoulder the next morning, but the main attraction of this story is dark, sickly mood of impending doom permeating the plot. The final story of the lot, "Murder on New Year's Eve," takes place in that same desolate place, but the explanation ends both this collection and Judge Dee's run as magistrate of Fan-lang on a positive note. It's a short, touchy story and that's all that can be said about it without giving anything away. So, all in all, Judge Dee at Work is an excellent and well-balanced collection of stories, which can be read as both detective stories or historical fiction. And that makes it hard to be disappointed if you're a fan of one or both genres, but that goes for the entire series. Recommended! Finally, if this review appears clunky or overwritten without the usual amount of detail... well... I finished this collection nearly two weeks ago and was in the hospital at the time. So not every detail was as clear as it should be when I finally began cranking out this review, but I'm getting back on track. "...And all that was left to do was put together the pieces." Some time has passed since I last read a novel from Bill Pronzini's four decade spanning series about his "Nameless Detective," but the previous review on this blog, covering the recently translated The Decagon House Murders (1987) by Yukito Ayatsuri, gave me a splendid excuse to delve into Quicksilver (1984) – which has a plot touching upon the unique history between the United States and Japan. In the opening chapter of Quicksilver, Nameless has gone into an official partnership with an old friend, ex-police lieutenant Eberhardt, who found office space in a good location, but the rent is pushing nine-hundred bucks a month. Luckily, there's a client waiting in the wings. Haruko Gage has been the target of an anonymous, but generous, admirer who keeps sending her expensive gifts in the form of jewelry, which appears as an easy enough of a job for Nameless. It's simply a case of checking on some of Haruko's former lovers and hopefuls who were rejected. But things are seldom this easy for him. These inquiries take Nameless to San Francisco's Japantown, but what began as a fairly benevolent problem turns into something far more sinister when Nameless visits a public bathhouse and stumbles upon the remains of a member of the Yakuza – hacked to the death with a katana! It's not the only unnatural death Nameless finds on his path, but, in spite of the presence of the Yakuza, the book isn't a repeat of Dragonfire (1982) and his descend into the mafia-controlled quarters of Chinatown. Dragonfire was a hardboiled tale that put Nameless in the hospital and Eberhardt in a coma, which came on the heels of two unapologetically, classically styled-and plotted novels, Hoodwink (1981) and Scattershot (1982), but Quicksilver falls somewhere in between – i.e. a character-driven detective story with professional criminals lurking in the background. The trail of bodies is slowly guiding Nameless many decades into the past, all the way back to the early 1940s, when American citizens of Japanese descend where thrown in internment camps for the duration of World War II. And the now often forgotten crimes that took place there. I think mystery fans that've read a fair amount of Japanese detective fiction will recognize a familiar theme in the motive and identity of the murderer, but I don't know if that was done as a conscious nod to their corner of genre – considering there was even less Japanese crime fiction available in 1984 than there's now. 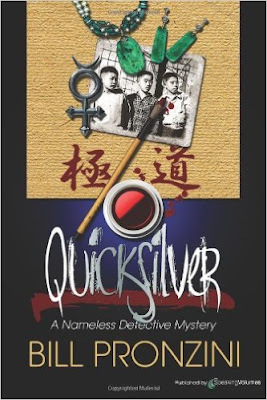 There's also the all important difference that Quicksilver was written from an American point-of-view, in the hardboiled vein of Dashiell Hammett and Raymond Chandler, which makes this an item of interest for scholars/connoisseurs of the Japanese crime story. It is interesting as comparison material to how Japanese mystery-and crime writers tackled this subject. What makes the "Nameless Detective" series of interest to a plot-obsessed classicist, like myself, is not only the occasional excursions to the locked room niche (e.g. Hoodwink, 1981 and Bones, 1985), but also how relatable Nameless (and Pronzini) is as a fellow mystery fan boy. Nameless observes how a police-inspector, named Leo McFate, "talked like Philo Vance" and how a door "creaked open like the one on the old Inner Sanctum radio program." And than there's Nameless' collection of pulp magazines, which feature or is mentioned in nearly every novel. In this story, Kerry Wade borrowed an issue of Midnight Detective with a luridly illustrated cover in the Yellow Peril tradition. My "Paperjack" edition has a synopsis that was written in that frame, because it promises such things as "a violent ritual murder" and "perverse kidnapping." That's not at all the well put together, calm and slow moving story, which has the patience of meandering river that knows it'll eventually reach its inevitable conclusion – and doesn't need any gore to disturb its readers. In short, Quicksilver is a great entry in the Nameless series and this badly written review really doesn't do it any justice. Read it for yourself. "These writers (with others like them) are the aristocrats of the game, the old serpents, the gambit-devisers and trap-baiters whose strokes of ingenuity make the game worth playing at all." 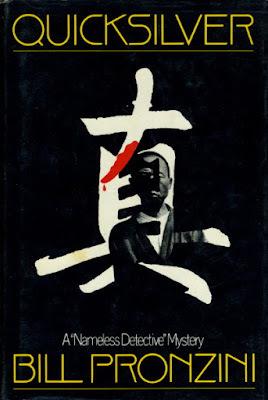 In late June of this year, John Pugmire's Locked Room International published a translation of a landmark mystery novel from the land of the rising sun, Yukito Ayatsuji's, Jukkakukan no satsujin (The Decagon House Murders, 1987), which is credited with launching the neo-orthodox (shinhonkaku) movement – and putting an end to the dominance of the socially conscious crime novel. If only that would happen over here in the West. The Decagon House Murders was translated by our very own tour guide through the largely uncharted territory of the Japanese mystery novel, Ho-Ling Wong, who also wrote a postscript on the Kyoto University Mystery Club. They stood at the cradle of this movement and a thinly disguised version of the club (and its members) figure prominently in the book. A short introduction on the neo-orthodox movement was penned by Soji Shimada, author of that bloody tour-de-force known as Senseijutsu satsujinjiken (The Tokyo Zodiac Murders, 1981), and sandwiched between the introduction and after word is the answer to an all-important, but rarely posed, question: what do you get when you populate Agatha Christie's And Then There Were None (1939) with the type of characters from Peter Lovesey's Bloodhounds (1996)? Tsunojima is a small, deserted island off the coast of Japan and would've simply been one of the many, undistinguished rocks in the island nation if it weren't for the burned down ruins of a mansion and decagon-shaped house – which where the scene of a gruesome, quadruple murder case less than a year before the opening of the story. So it goes without saying that the island is the perfect location for an excursion for the members of a certain university mystery club. The club-members are known throughout a majority of the story by their adopted nicknames: "Agatha," "Carr," "Van Dine," "Ellery," "Leroux," "Orczy" and "Poe," which are, of course, names of famous mystery writers from the past – primarily from our Golden Age. One of them was exposed in the prologue to harbor plans to commit a small-scale massacre on the island, but the letter promising five victims, a detective and a killer at the end of their stay is taken as a joke or attempt at setting up a murder game. There are also letters circulated to club members on the mainland, which pertain to tragedy that took place on the island several month ago and a death related to the mystery club itself. From this point on, the narrative alternates between the mainland investigation into the past murders and the rising body count on the island in the present. The former poses some interesting questions: why did the murder take several days to murder three or four people? Why was the hand of one of the victims severed? Where's the gardener who disappeared after the murders? Why do the current series of murders on the island tend to mimic the ones from the past? My exposure to Japanese mysteries have mainly come from comics (manga) and some cartoons (anime), such as Case Closed and The Kindaichi Case Files, but you can easily see how the neo-orthodox movement influenced even that specific branch of mystery fiction. There's the cast of high-school or university students in a remote, isolated location with a dark crime in the past and a murderous avenger in the present, which is also pretty much a basic plot synopsis of every Kindaichi story. Perhaps the best example comes from an animated series, Detective Academy Q, which has several episodes forming The Kamikakushi Murder Case and has arguably the best use of bizarre architecture – alongside several seemingly impossible disappearances. I should re-watch those episodes one of these days and review them here. They were really clever. However, as interesting and gratifying as the unapologetic attitude as an anti-modern crime novel might be, The Decagon House Murders has one or two flaws that you might expect from a debut novel – even from a (re)debut of an entire genre. The plot is furnished with all the classic trappings of a Golden Age mystery, but the clueing is sparse and you need experience, combined with some intuition, to make a stab in the right direction. You can't really play the clever and smug armchair detective, as the story begins to unravel, but the only real drawback for me was that the story lacked an impossible crime! There were none! Absolutely zero! And this book was published by Locked Room International! Shocking, Watson! Shocking! 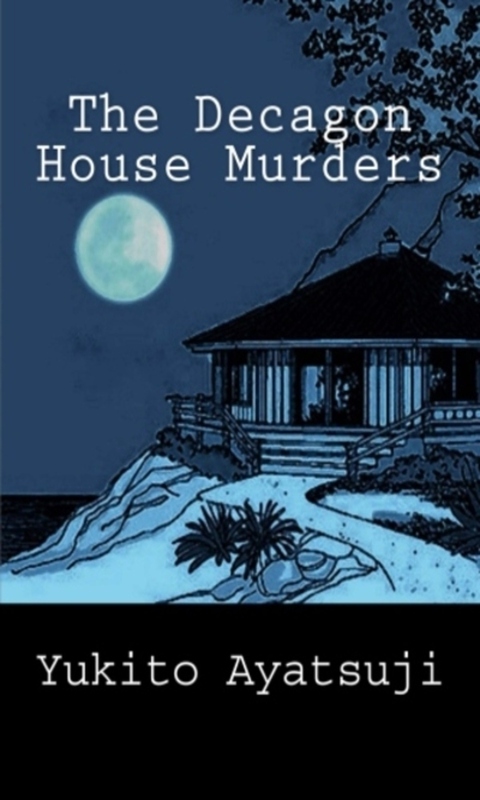 Anyhow... considering what The Decagon House Murders has done for my beloved, classically-styled detective stories in the East, as well as being an incredibly fun book to read, I was more than willing to look pass these minor flaws. And I'm very grateful to both Ho-Ling and Pugmire for tossing this one over the language barrier. May it be the first in a long row! Finally, the legacy of The Decagon House Murders gives me an opportunity to say to (the memory of) Julian Symons what should've been said a long, long time ago: in your face, you dry-mouthed fairy! "Arsène Lupin is a delicate, squeamish burglar. He loathes bloodshed, he has never committed a more serious crime than that of annexing other people's property... And what you're saying to yourself is that he is not going to burden himself with a useless murder. Quite so." 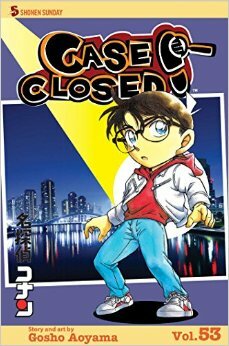 The 53rd volume of Case Closed, known better in some parts of the world as Detective Conan, opens with the longest story in this installment and concerns Kaito KID's latest caper – or so it appears. Takeyori Oikawa is a renowned artist responsible for a series of paintings depicting the "beauties of nature," which is one canvas removed from being a complete set. The fourth and final picture in the series is about to be unveiled, but in a note the infamous, white-clad thief promises to swoop down from the moonlit sky and scoop up the freshly painted masterpiece. As a precaution, Oikawa takes the only security measure that helped in the past against the sticky-fingered magician: the presence of a certain detective, named Richard Moore, and the little brat who's always tagging along. However, the great "Sleeping Moore" and Conan are unable to prevent the painting from disappearing from a semi-locked and guarded room, but there's a bigger problem – KID may've broken his own code and taken a life during the heist. Of course, this isn't strictly speaking a Kaito KID caper, but a Columbo-esque inverted story that's well motivated and clued. A locked room-style trick is used to create an alibi and to round out a solid plot, which makes this my favorite story from this bundle. The actual presence of KID in the background is merely an added bonus. The next story covers only two chapters and is what Bill Pronzini would've called a "humanist crime story," even though there is no (real) crime in the story. What makes it a humanist story is the motivation behind a game of code cracking that Ms. Koboyashi created for her students in Class B-1 and that's all I can really say about this revoltingly adorable story. A note for the curious: there's a note in the story signed with "The Fiend with 200 Faces," which is a reference to Edogawa Rampo's Kaijin nijuu mensou (The Fiend with Twenty Faces, 1936). The book was published in English in 2012 and has an introduction written by our fellow Connoisseur in Crime, Ho-Ling. In the third story from this volume, a young boy comes to the office of Richard Moore with a peculiar and cryptic story of having witnessed a crime around New Year. The kid saw a man throw a body from a bridge in the river and the identity of the victim may be that of a missing rock star, but the account of the boy is reads like cipher – which includes allusions to "a scary picture of a nail" and "a big shining hammer." The objective of this story is not so much the who-and whydunit angle, but retracing the steps of the child and making sense of his cryptic remarks, while the shadow of the Black Organization hovers in the background. And the possible connection between the B.O. and the apparently clumsy Eisuke Hondo, who keeps hanging around Conan and Moore. 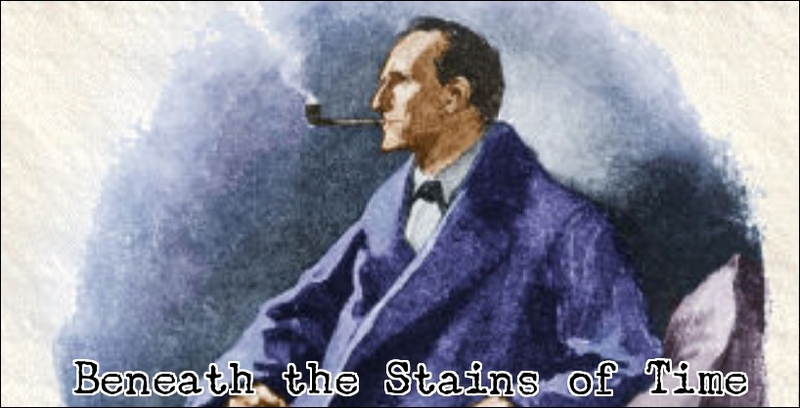 The final chapter of this volume is a set up of a story that'll be concluded in the next volume and begins when Eisuke brings a case to Moore's office that bears a striking resemblance to "The Red-Headed League" from Sir Arthur Conan Doyle's The Adventures of Sherlock Holmes (1891). This quickly leads them to the scene of a murder and Conan again feels the presence of the Black Organization, but that's a story for the next volume. So, all in all, a fine collection with a solid opening story and some interesting side-developments concerning the main storyline and recurring characters. I'll be back ASAP with a regular review. Probably a locked room mystery from Japan. Who knows! "So our final toast is inevitable." My undying love for John Dickson Carr's detective fiction is well documented on this blog and grab every opportunity to reference his stories in otherwise unrelated posts, but the backlog of his unread work has rapidly diminished over the years – leaving only a handful of standalones, historical novels and short stories. Well, there was one novel in the Sir Henry Merrivale series, And So to Murder (1940), which lingered on the pile for years, but decided it was time to finally wrap up that series. So here we go. The setting of the story is Pineham Studios during middle-and late August, "before there had come any glimmer of events that were to shatter Europe by the end of the month," where several movies are being shot. One of the productions is based on a best-selling, but scandalous, novel, entitled Desire, which was written by a canon's daughter from a small village. Monica Stanton is elated to have gained a position at the film studio as a scriptwriter, but those feeling quickly subside when Monica learns she isn't going to work on the adaptation of her own novel. A producer by the name of Tom Hackett assigned her to work on a script based on William Cartwright's latest detective novel, while Cartwright is adapting her novel for the big screen – which brings back memories of Monica's annoying aunt grieving over the fact she didn't write a nice detective story like Cartwright. Of course, Monica and Cartwright are simply ignoring their true feelings for each other, but, luckily for them, an aspiring murderer is driving them closer together by targeting Monica. A spate of incidents occur over several weeks, which include water in an innocent looking bottle being replaced with sulfuric acid and the same corrosive liquid is pored down a speaking tube – nearly disfiguring Monica. There are anonymous letters being passed around and a poisoned cigarette almost took the life of one of the actresses, but the problem is that these incidents are merely (detective) interruption in a character-driven, comedy of manners-style novel. And that makes it very difficult to review this book. 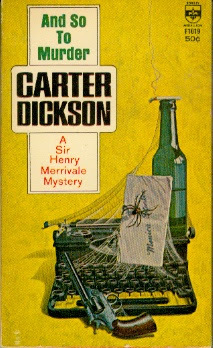 There are several titles from the Merrivale-series, written under the name of "Carter Dickson," in which Carr attempted to take a different approach to the detective novel, such as A Graveyard to Let (1949) and The Cavalier's Cup (1953), but they were still detective stories. Surprisingly, for Carr, And So the Murder merely masquerades as one and the mystery elements that are present are poorly handled. A portion of the information pertaining to the plot was withheld from the reader and that's detrimental to any impact the solution might have had, which had some points of interest. But were ultimately lost in the mess. A lot of the trouble could've been prevented if they simple had decided to lock a few doors or hire security guards. You have to wonder why H.M. even bothered with this case at all. And So to Murder has some points of interest: the depiction of the film studio and what goes on there were interesting, as were the characters buzzing around the sets and the flashes of humor, but as a detective story it was as unsatisfying as Seeing is Believing (1941) and Patrick Butler for the Defense (1956). I can only really recommend this one to completists. So, there you have it, after several years I finally wrote and posted as less than enthusiastic review about a John Dickson Carr novel, which I hope will be as rare an occurance as a snow-covered Sphinx. "If we're going to get to Mars, we're going to have to clear the maps. The dragons, Cyclops, and other monsters of the mind must be killed, and the siren exposed for the fraud she is." 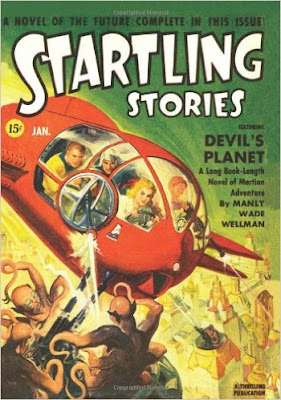 Manly Wade Wellman was, what you would call, a "fictioneer" and his bibliography covers a multitude of genres, which range from fantasy and horror to science-fiction and detective stories – raking in several awards along the way, e.g. World Fantasy Award and Edgar Allan Poe Award. I previously reviewed two stories from Wellman's body of work: an impossible crime novel with a hardboiled edge, entitled Find My Killer (1947), and a short story, "A Knife Between Brothers," collected in The Black Lizard Big Book of Locked Room Mysteries (2014). It's purely coincidental that both tales are listed in Locked Room Murders (1991), but the subject of this review, Devil's Planet (1942), apparently escaped Robert Adey's attentive eye. That's a shame, because it's an efficacious example of the science-fiction/mystery hybrid and predates Isaac Asimov's The Caves of Steel (1954) by more than a decade – which is considered to be the prototype for these type of genre-benders. Devil's Planet was originally published as a book-length novel in Startling Stories and takes place on the dry, parched surface of a dusty, drought-stricken Mars in the 30th century. And that's more than 900 years in our future! 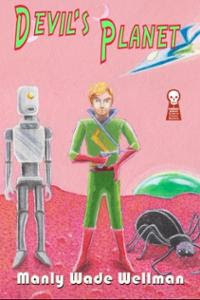 The protagonist of the story is Dillon Stover, who grew up on the laboratory farm of his late grandfather in the Missouri Ozarks, but has recently inherited both a small fortune and a mission from the old man: perfecting the condenser-ray to make rain possible again on the thirst-choked planet. But, before he can get to work, Stover visits Pulambar, "the Martian Pleasure City," which is the last place on Mars with lakes, canals and a well of trouble! Mace Malbrook is one of the (main) oligarchs presiding over Mars and the foundation of their rule is a tight grip on the water monopoly, but the first encounter between Strover and Malbrook ends with the former clipping the jaw of the latter – giving Malbrook an opportune excuse to get rid of Strover through a crooked duel. News of the altercation and possible duel between the two spreads, which makes Strover the prime-suspect when Malbrook dies in a mysterious explosion behind the locked door of his private and fortified room. A dying Martian, Prrala, was with Malbrook when the explosion occurred and claims Strover appeared in the room, while he was actually on the outside of the room. However, Prrala's final words are enough for Chief Agent Congreve of the Martio-Terrestrial League Service to place Strover under arrest, but that’s when the story really begins to move. Strover manages to escape from both the prison and the city. Nearly dies in one of the sun drenched deserts of Mars. Returns to the city and dons an ancient disguise to examine the scene of the crime, while dodging an eager murderer with an expending body count. Wellman adroitly blended fast-paced story telling with a well thought out plot and encapsulated all of these different elements in a new and fascinating world, which only seems to have one drawback: this universe appears to have stagnated, culturally and technologically, after the 20th-and 21st century, because there are references to "an ancient but most readable work," known as Alice in Wonderland, and the New York theatrical world of the twentieth century, but nothing more recent than that. The technology is unimpressive for a story that's set a millennium from now on a nearby planet, which is exemplified in the clunky, simplistic robot servitors trudging around the story. Plot-wise, a seasoned mystery reader should be able to piece together the identity of murderer and motive together, but the method for the locked room explosion deserves a nod of acknowledgment, because it's clever and reasonably well clued. I wonder if the idea for this trick and futuristic locked room scenario came to Wellman after reading [SPOILER: Nine Times Nine (1940) by Anthony Boucher]. Anyhow... if this poorly written review has made you curious about this exemplary specimen of a hybrid mystery, you can pick up a copy of Devil's Planet from both Adventure House and Ramble House.